Saucepans are bulky and can take up a lot of cupboard space so why not treat yourself to the Isabella Stackable Saucepan and Frying Pan Set. Not just for caravans or motorhomes, they are great for camping too. They are also ideal for homes where space is an issue. The set consists of three pots, one frying pan, three lids and two removable handles. 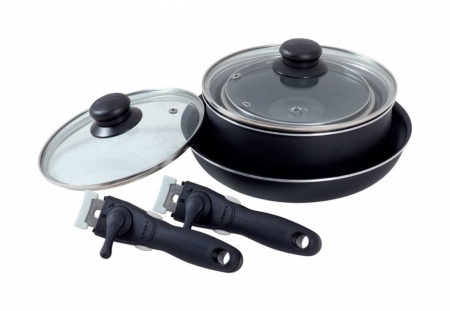 The set can be used on ceramic, gas or induction hobs. Each pot comes with a clear glass lid with steam escape hole in the lid and a black plastic knob for easy removal. The sizes are 16 x 7cm, 18 x 8cm and 20 x 8.8cm and they are black in colour. The Frying Pan is 24cm x 5cm and also black in colour. The pans come with two removable handles. There is a lever that locks and unlocks the handle into position for a secure grip and is a nice safety feature. There is a hole at the end of the handle so they can he hung up if need be.